The US president also praised Indian-American women Nikki Haley and Seema Verma. WASHINGTON: US President Donald Trump has said his administration will work to ensure America becomes a place where woman can work and thrive "like never before", as he praised his women colleagues, including Indian-Americans Nikki Haley and Seema Verma. At a White House panel discussion on women empowerment, Trump said US ambassador to the United Nations Haley, 45, is a tough competitor and is doing her job "fantastically well". The discussion was joined by Indian-American Seema Verma, who holds a key healthcare position in the administration, and First Lady Melania Trump made a rare appearance at the event. "My Cabinet is full of really incredible women leaders. Administrator Linda McMahon, who has been a friend of mine for a long time. She's done an incredible job in business. 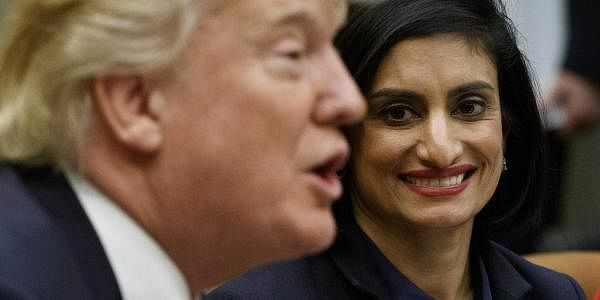 Administrator Seema Verma, Secretary Betsy DeVos, and, of course, my good friend from South Carolina who is a very tough competitor - Nikki Haley," Trump said. "My administration will work every day to ensure that our economy is a place where women can work, succeed, and thrive like never before. That includes fighting to make sure that all mothers and all families have access to affordable childcare," he said, adding "We want every daughter in America to grow up in a country where she can believe in herself, believe in her future, and follow her heart and realise her dreams." US Vice President Mike Pence described Haley as "cool" and said she is a favourite of one of his two daughters. "We are so honoured to have you in this administration," Pence said. He also praised Verma - the new administrator for the Centers for Medicaid & Medicare Services. "The truth is, American women are making a difference in our administration, in our economy, and in our communities every single day." White House Press Secretary Sean Spicer told reporters that the Trump administration is "committed to empowering women in the workplace."